In every series there are running jokes, gags and phrases that pop up every now and then. From Homer’s “doh” in The Simpsons to Sheldon’s *knock, knock, knock* “Penny” in The Big Bang Theory, certain things become synonymous with the franchise and games are no exception. With a series as long running as The Legend of Zelda it’s only natural that it would pick up a few, too. 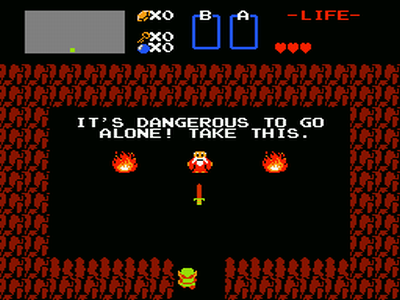 Some Zelda games have references to other franchises, like bob-ombs and chain chomps from the Mario series where as others make reference to previous Zelda games with the recently released A Link Between Worlds being one of them. It may just be a single line someone says but what they say has become a pretty well known. Find out what was said after the jump! As anyone who has played the original Legend of Zelda knows, there are loads of secrets to uncover around Hyrule and some of them can be particularly helpful but must are secret from everybody! Along with “it’s dangerous to go alone! Take this” the phrase “it’s a secret to everybody” has become well known and has appeared in several other Zelda games including A Link Between Worlds. It’s great that the developers not only put these lines in the games as reference to the previous titles but also have different circumstances in which the line is muttered. In The Legend of Zelda you find a friendly Moblin who helps Link, possibly meaning to keep the fact he is helping Link a secret from the other Moblins (as though Link would try talking to them!) 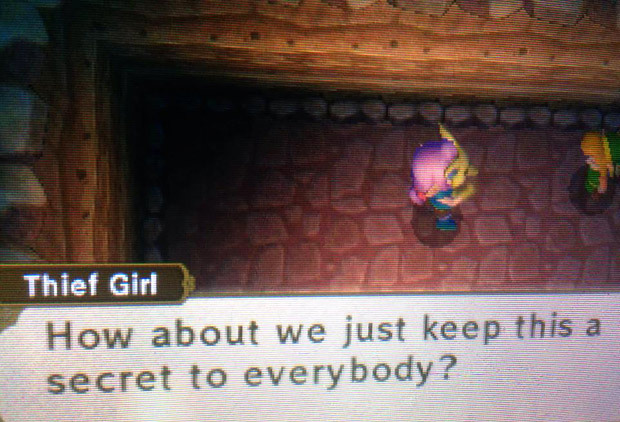 or other people so he doesn’t have people constantly coming to him but in A Link Between Worlds it’s muttered by ‘Thief Girl’ so I’m assuming you caught her stealing and she’s asked you not to tell anyone, like with Mila in The Wind Waker. My copy of A Link Between Worlds hasn’t arrived yet (though I did manage to get the 3DS XL bundle while play.com had it on special offer) so I’m looking forward to giving the game a try, seeing the circumstances surrounding this line being uttered and what other references are in the game. Have you seen this reference in the game? Have you noticed any other hidden easter eggs? Tell us all in the comments below.